When I was a young engineer a really great Tektronix scope had a 5" screen. 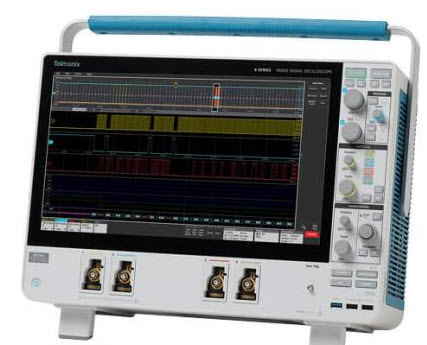 Bigger displays have always been one of the holy grails of oscilloscopes, and today, Tektronix's Series 6 scopes sport a stunning 15.6" display. 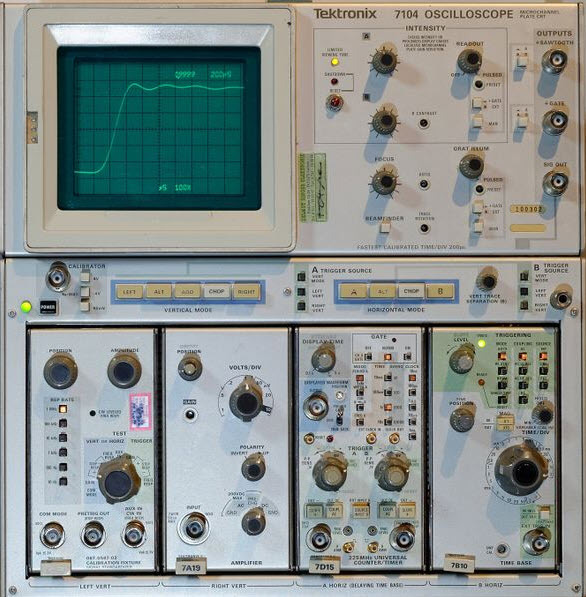 Once a scope was all knobs; today some are all displays. Since our goal is to see the signals, bigger is better. A USB scope can have as big of a screen as you'd like. Heck, connect an LCD projector and get a 6 foot image. But even without that extreme, most of us have pretty decent-sized monitors, far exceeding the 15.6" Tek monster. Some scopes have touchscreens now. That's pretty nifty. My arbitrary waveform generator has one but I find it easier to use the knobs. I tried a Rohde & Schwarz scope recently and didn't care for the touchscreen; it seemed more natural and less jerky to use the controls. My wife's computer has a touchscreen which I loathe, as every time I point something out to her my finger causes the computer to do something unexpected. While you just can't beat the screen size available with a USB instrument, I find the device under test is usually to the left or right of my computer because the keyboard is in the way, so it's a little unnatural to have to look so far away from the equipment I'm probing to see the display. The form factor of a USB instrument is fantastic - those units take up practically no bench space. Modern bench scopes all have switching power supplies so weigh little, but the USB equivalent practically floats like a feather. Toss one in your briefcase for travel and TSA might be curious, but you'll still have room for a laptop and the latest Steven King blockbuster. A bench version is its own carry-on. Bench scopes have gotten so lightweight that there is a new problem: a BNC probe needs firm pressure to connect. The scope then slides back on the bench until it hits the wall or falls off. You need one hand to steady the instrument. 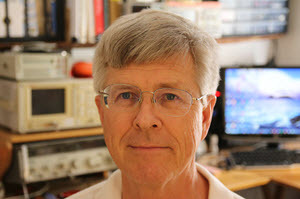 I've screwed a block of wood behind my main oscilloscope to keep it from moving, permitting one-handed connections. In general, the USB versions have much worse specs than their bench brethren. There aren't many 100 MHz versions, with the notable exception of Pico. Then there's cost. 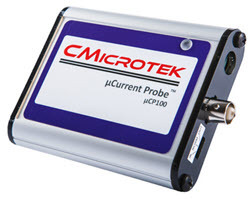 Some of the USB instruments are under $100... though their specs are such that they probably aren't much use for embedded work. But that price is unbeatable for educational purposes or audio efforts. Yet the Chinese are offering some bench scopes for astounding prices. Rigol and Siglent both offer two channel very nice 100 MHz scopes for just $300. But what about knobs? I like having knobs. When holding a probe in one hand, another in your mouth, you can reach up and quickly change the time base without much effort. Mousing around to do the same thing on a GUI requires more agility. With a bench scope you are probably looking down at the device being tested and the scope a few inches beyond; even with bifocals switching focus between the two is easy. It's tougher to hold those probes on that SMT part and then look way over at the PC's screen. On the other hand, some scopes have so many controls that I have trouble finding the right one. With aging eyes it isn't easy to read the small on-knob print to locate a not-often-used function. Personally, I favor bench instruments. But very good arguments can be made for a USB version, and I do keep one of those on the boat. But is anything cooler than a lab bench bristling with fancy test equipment with flashing lights and big displays?